If you live in an apartment, condo, loft, or other home without out a lot of outside living space, you may be attracted to keeping flowers indoors. Flowers bring a bit of beauty and oneness with nature into our lives, so we completely understand a desire to have these things despite not having an outdoor area to enjoy them in. Oxalis are perfect indoor, easy-to-grow flowers. 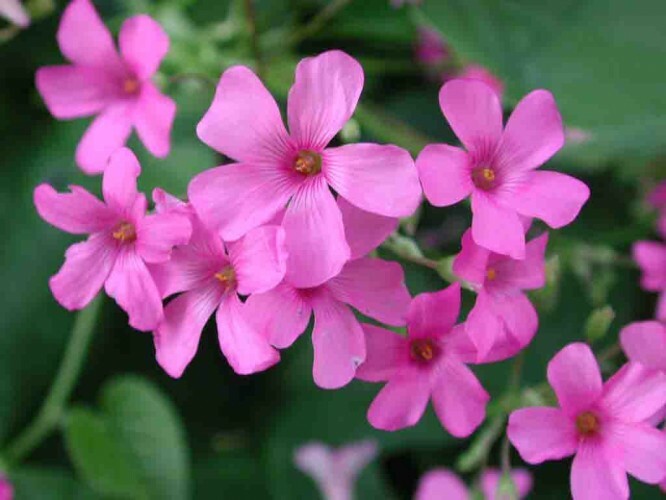 They offer gorgeous, triangular, and clover-shaped leaves as well as pretty pink, or white, blooms. You can find Oxalis varieties that offer plain green foliage or green foliage with shimmery silver accents. Oxalis grows from bulbils in soil, so you can divide this plant into many pots if it gets too big. Oxalis are indoor flowers that like relatively moist soil. Also called clivia, the kaffir lily is a houseplant that typically blooms during winter. It gets clusters of reddish-orange, or yellow, tubular flowers (up to 20 on a single plant), but it blossoms only when exposed to dry, cool conditions. So, we suggest you keep this plant as a winter plant if you want to show off its colors, and remember not to water it too much. Kaffir lily, even when not in bloom though, is a beautiful plant that fits in with a variety of décor. Commonly known as Cape primrose, streptocarpus can bloom continuously wen growing it conditions it enjoys. Most streptocarpus varieties bear pink, purple, red, or white flowers. Sometimes these blossoms have stunning, contrasting yellow throats that are quite exquisite. Cape primrose is an indoor flower that thrives in cooler temperatures and it’s easy to keep around if you don’t water it too much, or let it dry out, just like the African violet. Any of these indoor flowers will bring beauty and life into your home, during winter days when you spend a lot of time inside or throughout the year if you’re lacking an outdoor garden. We love them all, so we’re thinking getting one of each. Do you keep any of these plants in your house? Do you have other indoor flowers you love to have around? Feel free to let us know in the comments below.